Benjamin Rush, eminent Physician, writer, educator, humanitarian, is as interesting a figure as one could find in the formation of the United States. A wildly popular and much loved man, he was nonetheless a fallible character. He was born in December of 1745 in Byberry, Pennsylvania, some twelve miles from Philadelphia. His father died when Benjamin was six, and his mother placed him in the care of his maternal uncle Dr. Finley who became his teacher and advisor for many years. In 1759 he attended the College of Philadelphia, where he ultimately attained a Bachelor of Arts degree. He continued his education with a Dr. Redman of Philadelphia for four years and then crossed the Atlantic to attend to an M.D. at Edinburgh. He spent several years in Europe studying and practicing Medicine, French, Italian, Spanish, and science. He returned in 1769, opened a private practice in Philadelphia, and was appointed Professor of Chemistry at the College of Philadelphia. 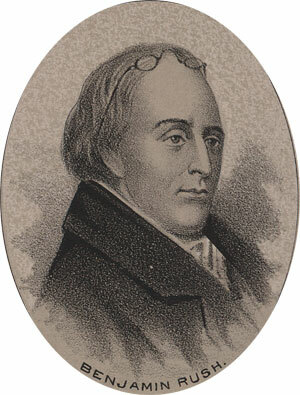 Benjamin Rush was soon beloved in the city, where he practiced extensively amongst the poor. His practice was successful, his classes were popular, and he further began to engage in writing that would prove to be of considerable importance to the emerging nation. Rush published the first American textbook on Chemistry. In 1773 he contributed editorial assays to the papers about the Patriot cause and also joined the American Philosophical Society. He was active in the Sons of Liberty in Philadelphia during that time. In June of 1776 he was elected to attend the provincial conference to send delegates to the Continental Congress. He was appointed to represent Philadelphia that year and so signed the Declaration of Independence. In 1777 he was appointed surgeon-general of the middle department of the Continental Army. This office led to some trouble for him; he was critical of the administration of the Army Medical service under Dr. William Shippen. He complained to Washington, who deferred to the Congress. Ultimately Congress upheld Shippen and Rush resigned in disgust. As the war continued and Army forces under General Washington suffered a series of defeats, Rush secretly campaigned for removal of Washington as commander in chief, and went so far as to write an anonymous letter to then Governor Patrick Henry of Virginia. He was caught in the act and confronted by Washington, at which point he bowed out of any activities related to the war. In 1789 he wrote in Philadelphia newspapers in favor of adopting the Federal constitution. He was then elected to the Pennsylvania convention which adopted that constitution. He was appointed treasurer of the US Mint where he served from 1797 to 1813. Rush’s teaching career and medical practice continued till the end of his life. He became the Professor of medical theory and clinical practice at the consolidated University of Pennsylvania in 1791, where he was a popular figure at the height of his influence in medicine and in social circles. He was also a social activist, a prominent advocate for the abolition of slavery, an advocate for scientific education for the masses, including women, and for public medical clinics to treat the poor. Benjamin Rush was a regular writer, and many notes about the less well known signers of the Declaration come from his observations on the floor of congress. Other members of congress, Franklin, and John Adams foremost, had some harsh observations to make about Rush. He was handsome, well-spoken, a gentleman and a very attractive figure-he was also a gossip and was quick to rush to judgement about others. He was supremely confident of his own opinion and decisions, yet shallow and very unscientific in practice. His chief accomplishment as a physician was in the practice of bleeding the patient. It was said that he considered bleeding to be a cure for nearly any ailment. Even when the practice began to decline, he refused to reconsider the dangers of it. He died at the age of 68 at his home in Philadelphia, the most celebrated physician in America.